Aah! Christmas is almost here and I have hardly posted any crafts. I thought I'd share this one anyway because it was so much fun to do. 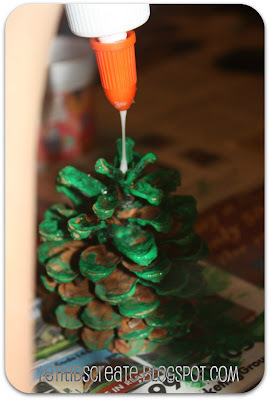 Last year we painted pinecones and decorated with glitter, but I don't know what happened to them. I couldn't find them this year so, of course, we had to make some new ones. 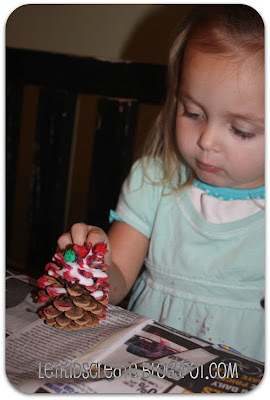 Back in June we did this open-ended craft with pine cones and Mina stuck pom poms all over her pinecone, so I knew those had to be part of our Christmas tree pinecones this year. I let the girls each pick a color because, like usual, they don't like to use the conventional colors for things (which makes it more fun, I think). Lou chose to paint hers pink. Mina's favorite color at the moment is red, so of course that is what she chose. I had to include this shot of Mina- just look at the look of concentration on her face. She was very careful and deliberate with the paint. She normally loves painting anyway, but I think a 3-D object always makes it much more interesting. Maisy wanted to make hers look like a real Christmas tree so she chose green. 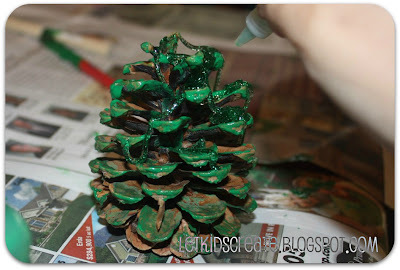 Green paint and green glitter glue. 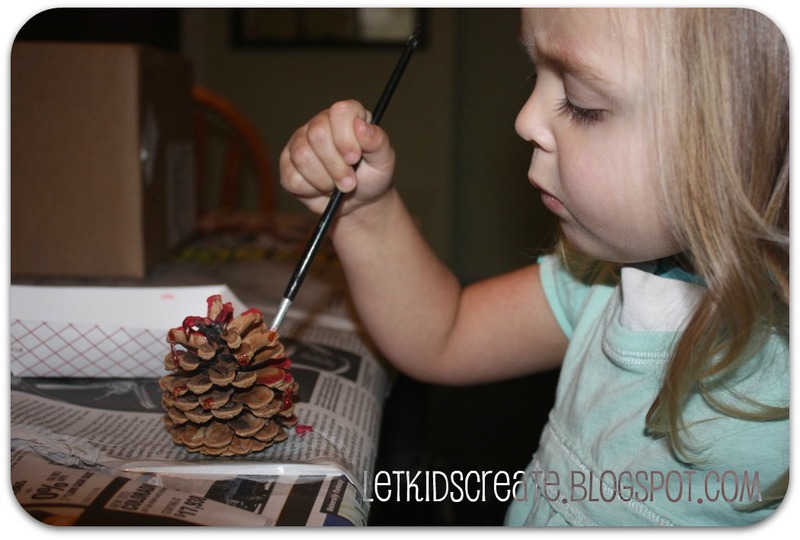 She, unlike Mina, was very careless with the paint. She was in some sort of a rush. 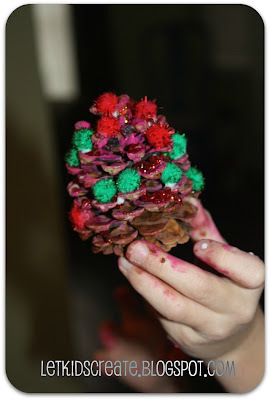 Maybe she just wanted to get on with the next step of adding the pom poms for ornaments. 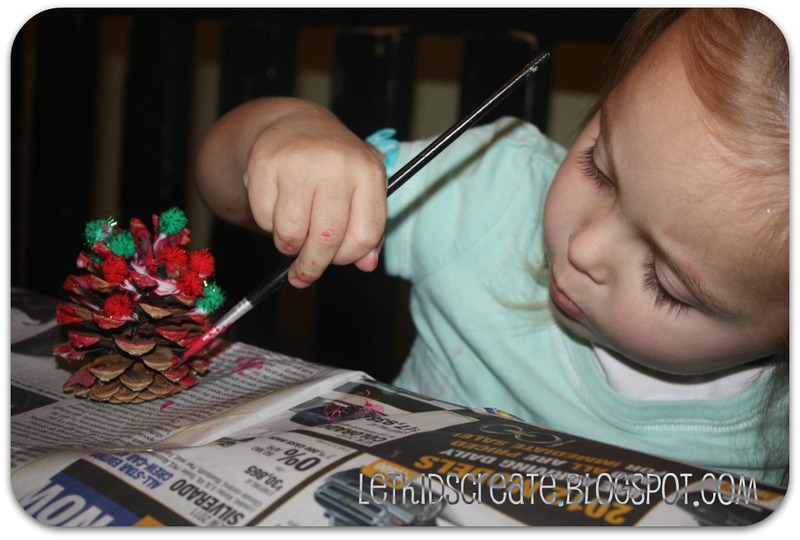 Maisy was excited to get that bottle of glue going. 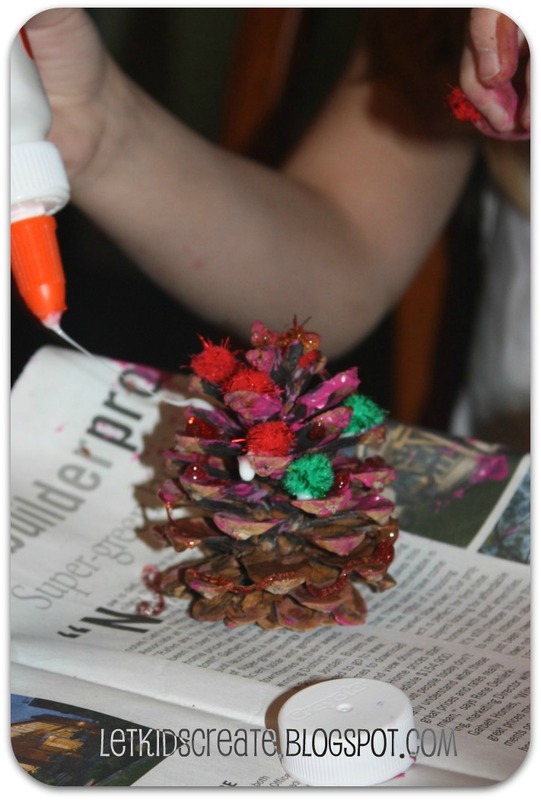 The glue squeezing may have even been more fun than sticking on the pom pom ornaments. This is Lou's tree amid her decorating. And Mina's pinecone tree with an excessive amount of glue. She had to be sure those pom poms would stick! And of course don't forget touching it up a bit with a little more paint. 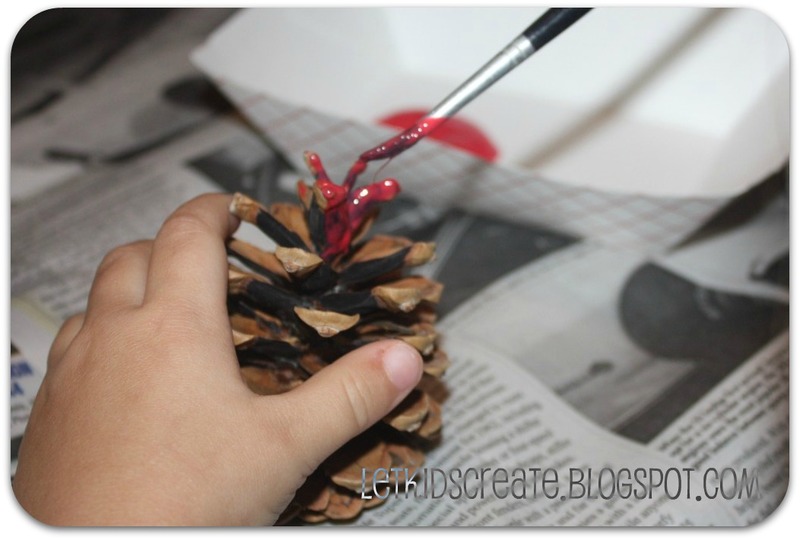 What last minute crafts have you been doing? 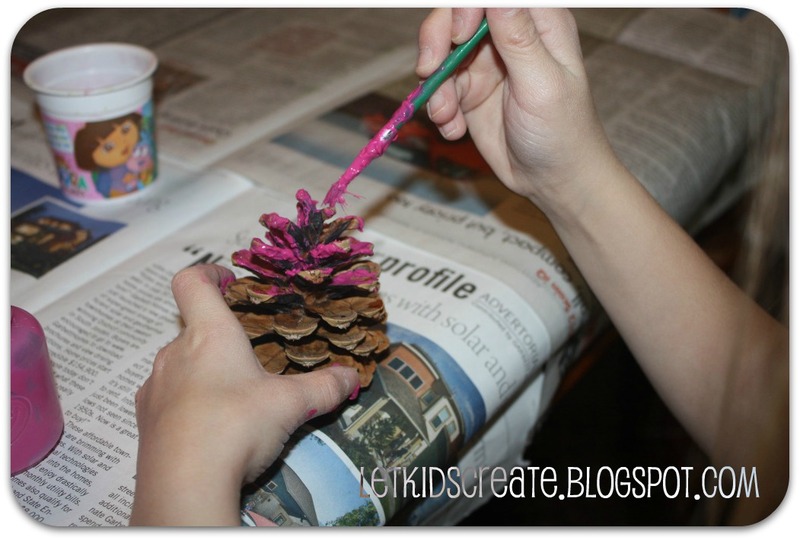 I love the idea of painting the pinecones! 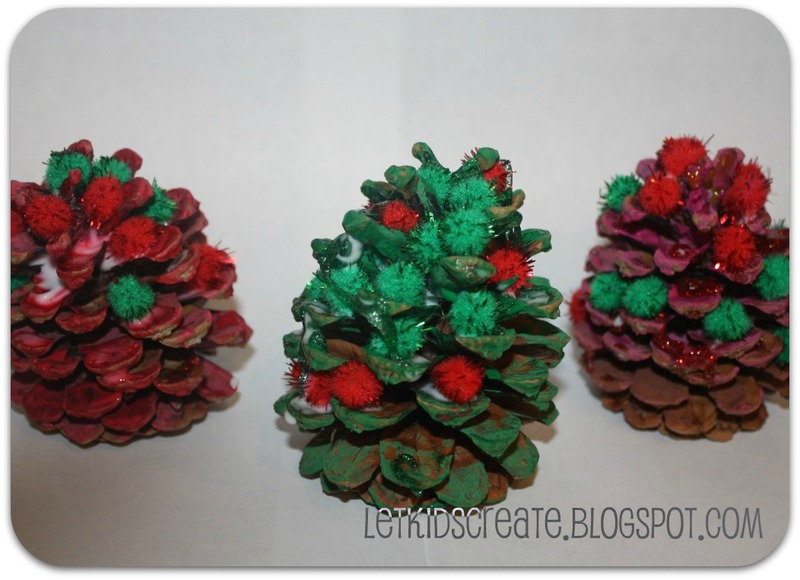 They do look like little Christmas trees - so cute.